Ryan Aeronautical Company of San Diego, California designed and manufactured a series of WW2 trainers. This model is rarely seen flying or displayed these days! Our PT-20, NC17348 is on loan from member Dave Masters. He wrote: “I have had a PT-20 for over 50 years and it has been in flying condition since around 1968. For those who don’t know about the PT-20: In 1939 Ryan modified 30 of the STAs for the military, making the cockpit openings larger (like the STM) and designated them PT-20s. All but one or two were re-engined to the 125 Kinner and re-designated PT-20A. When I bought this Ryan, it was a PT-20A and I converted it back to a PT-20 with a Menasco engine. 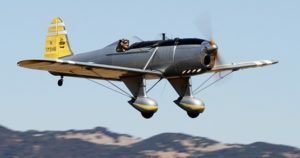 For the past 15+ years, it has been based at the Sonoma Valley Airport (sonomavalleyairport.com) and was moved to the Wings of History Museum in 2017.” Also on loan is his spare Menasco engine displayed next to the PT-20. 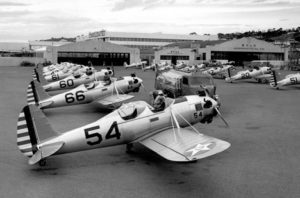 Again, from Dave: “The PT-20As are lined up at the Ryan Co. ramp (photo), Lindbergh Field, San Diego. My PT-20 isn’t in view in this picture but I’m sure it was there. It had a field number 57. In 1939, only 30 PT-20 were manufactured. All but one was re-engined with a 125 hp Kinner engine.” Note the big Consolidated Aircraft Co. building behind the Ryan hangars. The B-24 Liberator was designed in San Diego. Rubin Fleet was a big man down there.” From Wikipedia: Reuben Hollis Fleet (March 6, 1887 – October 29, 1975) was an American aviation pioneer, industrialist and army officer. Fleet founded and led several corporations, most notably Consolidated Aircraft Company of SanDiego, California. Ryan PT-20 Engine: Manasco Super Pirate 125 hp Wingspan: 30 feet Length: 21 feet Weight: 1018 pounds Cruise Speed: 115 mph – maximum 124 mph @ 3000 feet In an era dominated by biplanes (1933-1934), T. Claud Ryan decided the Ryan Corporation should manufacture a low wing monoplane trainer. He designed the “Ryan Sport Trainer” and took full credit for the aesthetics. 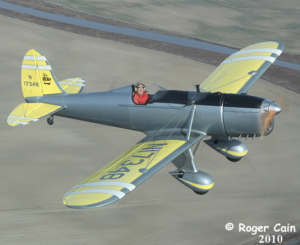 The “Ryan ST” became one of the great classic aircraft of the thirties. It was a favorite of the well-to-do sportsman pilot. The PT-20 is a military version of the Ryan ST. Three hundred and thirty-six of the ST series airplanes were manufactured from 1934 to early 1940. In late 1939, the Ryan Corp. manufactured a total of 30 PT-20 planes at a unit price of $6453. Of the 30 built, two still exist.